When you have a paint job to accomplish and you want to avoid the paint rollers or brushes, this Wagner HVLP Control Spray Max paint sprayer is a great option. It’s low-cost makes it affordable for tackling any projects and the ease of use means that even a beginner can paint with it. A smaller painting job usually costs around 125-$230 for a handyman to paint a fence or door. Why not save the money and do the job yourself? What Is This Wagner Spray Gun Best For Painting? Whatever your household painting tasks are, this easy to use Wagner Control Spray Max paint sprayer is a great option to consider. This compact and lightweight paint sprayer are ideal when you need to reach into those tight spaces. Especially since the unit will sit on a stationary base and be stable. You don’t have to hold the entire paint sprayer while working, just the small gun that is included. It also comes with a plastic 1.5-quart cup for the larger projects and a professional grade metal cup for your smaller fine finish applications. It features several adjustments to get the perfect paint job every time. The variable air pressure control means you will have less overspray when working with thin materials. In addition, you will receive 2 attached and replaceable air filters that enable you to protect the finish of your work. Avoid pulling out your paint rollers and brushes each time you have a project to tackle. This Wagner Control Spray Max sprayer weighs just 11.2 pounds and is ideal for getting a job done quickly. With the easy setup, a quick spray and fast cleanup, you’ll be done painting and back to doing the things you enjoy in no time. Go ahead and use this sprayer with confidence as it comes from the trusted Wagner name and has a 1-year warranty against defects. You can easily use this unit to spray latex or thinner materials as needed. Lacquers, stains, and paints are no match for the Wagner Control Spray. The variable flow control will allow you to cover large surface areas or small detail work with just a few adjustments. You can effectively stain, seal, varnish or spray interior latex paints and other materials for most any project. The reduction of overspray also means you can easily use this on your indoor projects. For outdoor use, consider staining your deck or painting the garage doors. It is also good for painting the window frames, fence or small projects like refreshing the look of your mailbox. 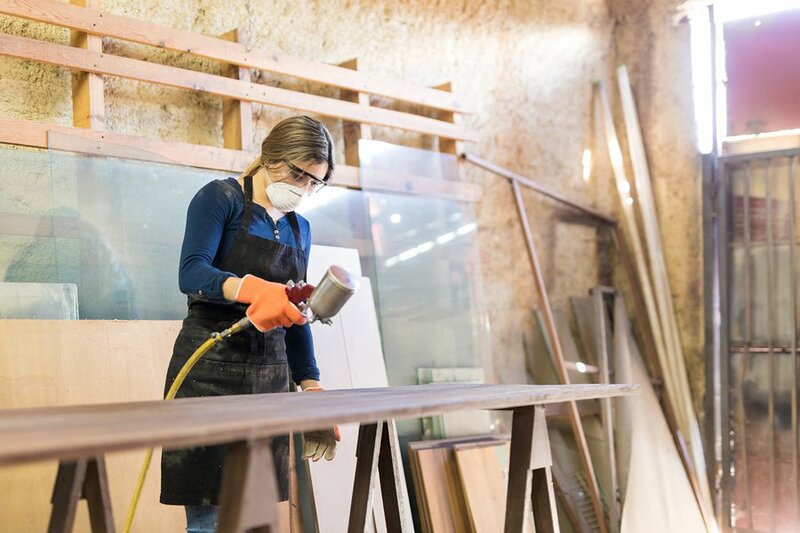 For indoor use, consider giving your cabinets a fresh look, staining wood furniture or doing delicate trim work. Whether you are a hobby painter or you are looking to renovate your house, the 0518080 is a great choice. The 20-foot High Flex Air Hose allows you to extend your reach over the typical handheld unit. This helps you to reach even the tightest of areas with ease. Beginners would also be able to catch on quickly as the unit has a quick setup and cleanup. Just be sure that you take some time practicing the different techniques and adjustments before getting started. Getting started with the Wagner Control Spray Max is a cinch. Start by aligning the arrow with the “unlock” symbol. Then, lock the handle in place. You will then prepare your materials and place them in the cup. Then, lock the handle in place. You will then prepare your materials and place them in the cup. Make sure the suction tube is properly aligned, either forward for a spraying down or back for spraying up. Now, you are ready to attach the hose to the turbine and the gun. Make sure you take the time to make the necessary adjustments, which I will talk about in a minute. Plug in the unit and practice your spraying skills. This HVLP paint sprayer stands for high-volume, low pressure. It features a variable flow trigger which will dial in the spray pattern width from 1-inch all the way up to 10-inches. This is the equivalent to 1.50 – 2.63 PSI which means a huge reduction of overspray, especially when working with thinner materials. The included 570 W two-stage HVLP turbine that the Wagner 0518180 is equipped with is so versatile that you can use it to spray liquids of various viscosity. Depending on the alignment of the nozzle and the air cap, you’ll have three different spray patterns to choose from. This allows you to choose what is best for the job. The horizontal air cap allows you to spray in a high and oval pattern. The vertical air cap allows for a broad and oval pattern. Using a diagonal air cap position is going to offer a symmetrical circular spray pattern. You will also be able to adjust the material flow by turning the regulator that is located on the trigger of the spray gun. The unit also comes with 2 air filters to help reduce dust. These are easy to remove, simply press the tabs on each side of the turbine. Remove and replace with new ones. This is an important step to do every so often to ensure the best paint job possible. The process of cleaning up after your paint job is painless and simple. You will want to unplug the machine and rinse the cup out. Then use some warm, soapy water if you’ve painted with latex materials and mineral spirits if you’ve used oil-based materials. Run the solution through the sprayer for several seconds into a bucket. You’ll also want to be sure that several parts of the spray gun also get a thorough cleaning. Gently wash the container seal, suction tube, air cap, and nozzle. All of these cleanup steps are imperative to do after each use if you want your paint sprayer to last a full life. This Wagner 0518080 Spray gun is another excellent choice on the low to the medium budget range. Its features are marginally better than similar Wagner models meaning it offers more versatility. Other spray gun products are needed for bigger paint jobs. Overall an excellent choice for those small and simple paint tasks at home.